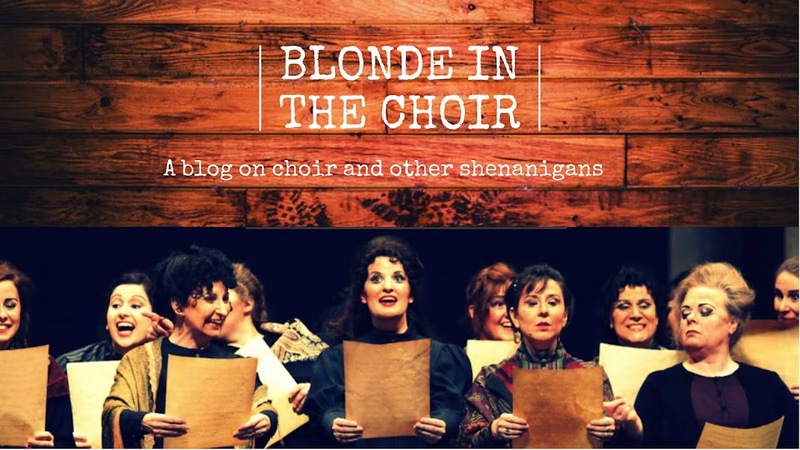 Today's bilingual blog post is the third of many interview previews of performing choirs for PODIUM ON THE EDGE taking place from June 28 - July 3, 2018 in St. John's NL! Inscrite dans la tradition des grandes maîtrises dont les origines remontent en Europe au VIe siècle, la Maîtrise des Petits Chanteurs du Mont-Royal a été fondée à Montréal en 1956 par père Léandre Brault de la congrégation de Ste-Croix. La Maîtrise a pour mission de donner une formation musicale avancée dans le but de former un chœur qui vient enrichir la liturgie lors des célébrations de l’Oratoire Saint-Joseph du Mont-Royal. La Maîtrise est composée de 210 garçons âgés de huit à dix-sept ans. Ces enfants, d’origines culturelles diverses, proviennent du Montréal métropolitain. La Maîtrise est une école où l'enfant, tout en faisant ses classes régulières, reçoit une formation musicale spécialisée en chant choral. Les élèves découvrent les grandes œuvres polyphoniques de toutes les époques, leur répertoire s’étend du chant grégorien aux œuvres vocales contemporaines. Ils étudient le piano, le solfège, la technique vocale, le chant choral et le répertoire sacré et profane. Au secondaire, le élèves poursuivent leur cours de musique et l'apprentissage du répertoire. Tout au long de l’année, on peut entendre les Petits Chanteurs du Mont-Royal à plus de soixante célébrations religieuses à l’Oratoire Saint-Joseph du Mont-Royal et lors de nombreux concerts. Ils participent également à plusieurs émissions de radio et de télévision, et sont régulièrement invités à se produire à l’opéra. Ils ont de plus souvent chanté à l’étranger, notamment en Corée, au Venezuela, à Cuba, aux États-Unis et dans différents pays d’Europe. 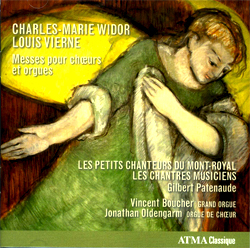 Les Petits Chanteurs du Mont-Royal ont plusieurs disques à leur actif; leur dernier est consacré aux œuvres de Vierne et Widor pour deux chœurs et deux orgues. L'année 2016 célébrait le soixantième anniversaire de la Maîtrise des Petits Chanteurs du Mont-Royal. Monsieur Andrew Gray est le directeur musical et artistique de la Maîtrise et Madame Johanne Chantal en est la directrice générale. 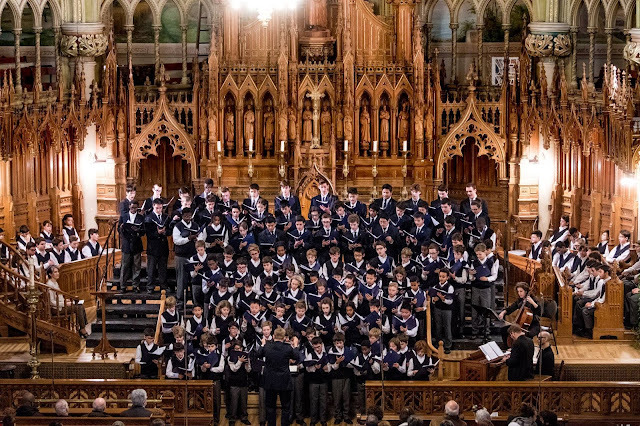 AG: Les Petits Chanteurs du Mont-Royal is a choir school whose mission is to provide the choral music at St. Joseph’s Oratory in Montreal. 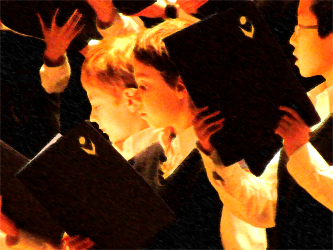 It is not entirely unique in terms of its structure, but what is more rare (certainly in comparison with the European choral tradition) is that all the voices in the choir, including tenors and basses, are school children between 10 and 18 yrs. There are around 200 children in the PCMR system at any given time which starts with two years of training before singing any concerts or masses. The PCMR choir sings at around 75 masses and gives around 30 concerts per year. What might be more unique for a choir of this type and this age group is performs a cappella 95 percent of the time and not, as one might expect, with organ accompaniment. AG: Recent highlights include Mahler 10th Symphony with the Montreal Symphony conducted by Zubin Mehta, starting a new stage production of the film “Les Choristes” with director Serge Denoncourt, singing ‘O Canada’ at Vimy Ridge on Canada Day last summer (as well as at a Montreal Alouette’s game), preparing Leonard Cohen songs for a project with Les Grands Ballets Canadiens and performing Bach’s ‘Jesu meine freude’ to a packed Oratory as part of Montreal’s Bach Festival. The kids would add that they particularly enjoyed the Halloween project that was part of the Montreal 375 celebrations: we performed Saint-Saëns and gregorian chant with electro-DJ and strings, there were dancers and fire-breathers and the kids were all dressed up too! AG: This question embraces so many things and it’s a question that goes far beyond simply singing! 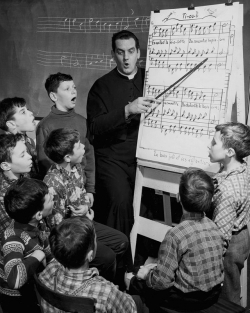 As a choir school we see the boys every day, often multiple times a day and, in doing so, we not only try to foster a love of choral singing, but provide and develop numerous tools for life. Developing a sense of team and of working as a team is of paramount importance, as well as to understand its purpose and how it can often produce results that surpass the abilities and possibilities of the individual. Working together so regularly and intensively develops a close bond, social skills, discipline and, certainly or us, with so much repertoire to cover each week, it also demands rigour, concentration and application from an early age. A trained chorister has no difficulty concentrating for two hours straight in rehearsal... a skill that will serve them well in the board room later in life! Whilst life at PCMR is centred around sacred repertoire for the many masses during the year, the breadth of repertoire that we perform still covers all ages of history and all genres, and this helps us develop the ‘all-round musician’. Describe challenges of programming because of the vocal development of your preteens entering puberty end up by the performance date, where do you begin when you start building a programme list coming to Podium? AG: The boys at PCMR start with us in 3rd grade and don’t stop singing until they finish secondary school! Each and every one of them will experience their voice breaking, some as early as 6th grade, others not until the middle of their secondary education. For some it happens fast and painlessly - this year one of our sopranos became one of our finest baritones over a single weekend! With others it is an extended process with parts of the register disappearing and others appearing, loss of voice, yodelling and so on. But they never stop singing. A bit less perhaps, but with the training they already have as sopranos and altos they already are aware of their instrument and how to handle it (using breath and support, experimenting with mix, falsetto and eventually settling into either tenor, baritone or bass) so that when the change happens they have already many tools to smooth the transition. One of the major challenges however is a motivational one. Young, effervescent and innocent young boys suddenly become adolescents... with a myriad of distractions and other activities to choose between. For this reason we try to vary the musical and social activities as much as is reasonably possible: outdoor festival concerts with DJ; concerts with the Montreal Symphony Orchestra and the Metropolitain Orchestra, collaborations with Les Grands Ballets Canadien, l’Opera de Montréal, Festival Juste pour Rire (“Les Choristes”), an annual 2-week tour and anything else we can come up with to help keep a choral life varied and ‘cool’. AG: Kids are incredible - I think we endlessly underestimate them and their capacities. The capacity to learn quickly, to absorb new information and to apply it naturally in other situations, to adapt, to assimilate multiple functions, to rise to the occasion, to perform under stressful circumstances and to undertake a massive workload. This is inspirational! It is also exciting to be able to open up a vast musical world to youth singers; to demonstrate how Bach swings, how Wagner influenced Star Wars, how Beethoven inspired the BeeGees, how Queen created 30-voice vocal harmonies and so on. 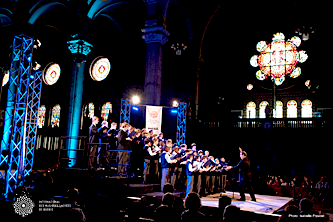 AG: The audience at Podium can look forward to hearing a wide variety of music performed by a Canadian a cappella mixed-voice choir of mostly francophone boys, who have been trained in a typical European choral tradition style. Repertoire will range from Bach, through Debussy, to Leonard Cohen. AG: Vital! A crucial element in defining and developing our national cultural identity is through artistic expression (musical or otherwise). Performing contemporary Canadian repertoire not just within the country, but exporting through touring and championing it through performance, not only helps us understand who and what we are culturally, but also helps define Canada and Canadians on the national stage. It also develops a pride in home talent and helps our young musicians understand that there is a wealth of opportunity here in the arts world. 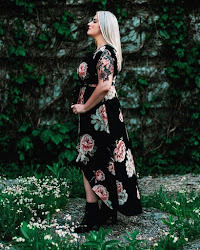 AG: I look first and foremost for an understanding of singers, an experience in writing for voices and an acknowledgement of the capacities of the given ensemble. Every group has a certain skill set, a certain capacity and a certain field of experience. The composer needs to be sensitive to these things and, whilst challenging the group, still work within certain parameters. No choir wants to commission a piece that they will struggle with, one that usurps rehearsal time, one that will only be performed once. Equally, no composer is served by producing a work that won’t be in demand, that isn’t published and that won’t be performed around the country and around the world. AG: I find that the biggest challenge when programming is trimming down all the possibilities into a concert that lasts just an hour, or just two hours. With all of the world’s now readily-available a cappella choral repertoire, both ancient and modern, and with more being produced every day, there are hundreds of works that could and would fit into any given programming concept. Deciding what not to include is an eternal problem... but a good one to have! What do you hope conference and festival attendees will take away from the experience? 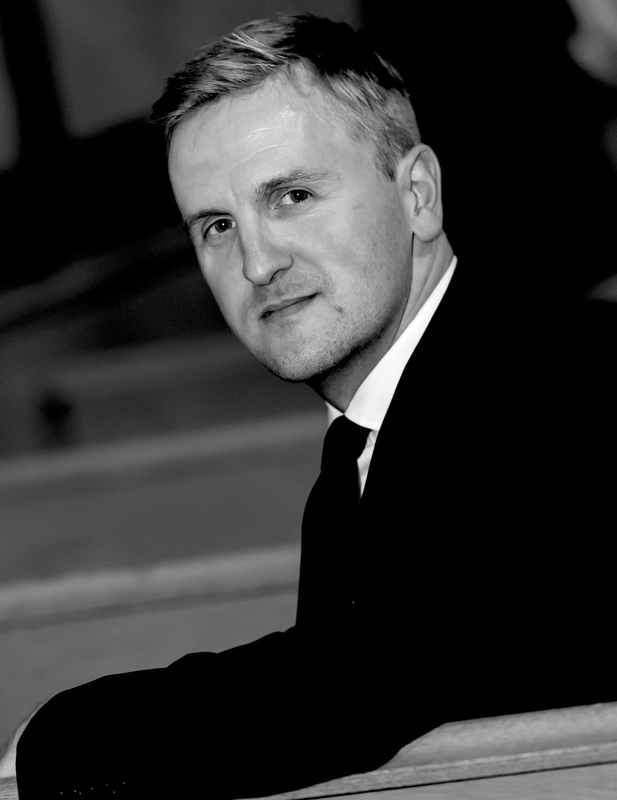 Andrew Gray is the Musical and Artistic Director of Les Petits Chanteurs du Mont-Royal, the Artistic Director of the Montreal Choral Institute, conductor of chamber choir Voces Boreales, and is also the founding director of choral education project Sing Montréal Chante. A native of Great Britain, Andrew was a chorister at Durham Cathedral, England from age 7. He obtained a Bachelor of Arts degree specializing in music and drama from the University of Birmingham. In 1997, he joined the internationally renowned a cappella group The Swingle Singers and toured with them for a period of five years. Since then, he has prepared choirs for various conductors and composers, including Kent Nagano, Zubin Mehta, Karl Jenkins, Joby Talbot, Gregory Charles, Iwan Edwards, Jordan de Souza, Jean-Sébastien Vallée, Jean-Pascal Hamelin, Robert Ingari, Alain Trudel, and Stéphane Laforest. In addition, he has directed vocal groups for popular music artists such as Coeur de Pirate, Les Trois Accords, The Beach Boys, Nikki Yanofsky, Marie-Mai, Malajube, Radio Radio, Sarah McLachlan, Kenny Rogers, Roger Waters (The Wall), and The Canadian Tenors. Since his arrival at Les Petits Chanteurs du Mont-Royal in 2016 he has been involved in collaborations with the Montreal Symphony Orchestra, the Montreal Bach Festival, Les Grands Ballets, Opera Montreal, the Schulich School of Music at McGill University, Montreal E375 and the Metropolitan Orchestra, to mention but a few. Andrew Gray est le directeur musical et artistique des Petits Chanteurs du Mont-Royal. Il est aussi le directeur artistique de l’Institut choral de Montréal, du chœur de chambre Voces Boreales, et le fondateur et directeur du projet choral éducatif Sing Montréal Chante. Né au Royaume-Uni, Andrew est devenu choriste résident à la cathédrale de Durham, en Angleterre, à l’âge de 7 ans. Il a obtenu un baccalauréat ès arts spécialisé en musique et en art dramatique à l’Université de Birmingham. En 1997, il est devenu membre de l’ensemble a cappella de renommée internationale The Swingle Singers ; il a fait le tour du monde avec eux pendant cinq ans. Depuis, il a préparé les chœurs pour de nombreux chefs et compositeurs, entre autres, Kent Nagano, Zubin Mehta, Karl Jenkins, Joby Talbot, Gregory Charles, Iwan Edwards, Jordan de Souza, Jean-Sébastien Vallée, Jean-Pascal Hamelin, Robert Ingari, Alain Trudel et Stéphane Laforest. Il a également dirigé des ensembles vocaux pour les artistes populaires Coeur de Pirate, Les Trois Accords, The Beach Boys, Nikki Yanofsky, Marie-Mai, Malajube, Radio Radio, Sarah McLachlan, Kenny Rogers, Roger Waters (The Wall) et The Canadian Tenors. Depuis son arrivée aux Petits Chanteurs du Mont-Royal en 2016, il a collaboré avec l'Orchestre symphonique de Montréal, le Festival Bach de Montréal, Les Grands Ballets canadiens, l'Opéra de Montréal, l'École de musique Schulich de l'Université McGill, Montréal 375e et l'Orchestre Métropolitain, pour n'en citer que quelques-uns. Les Petits Chanteurs du Mont-Royal perform on Tuesday, July 3rd, 2:00pm at the Cochrane Centre as a Spotlight Choir for #Podium2018.